After 6 days off the Rams were back on the hardwood, this time at home at the Siegel Center. 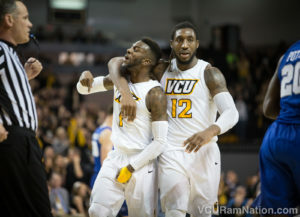 After leaving Norfolk last Saturday with a come from behind win against Old Dominion, VCU hosted Middle Tennessee State Saturday night and would just barely escape with a 80-77 victory. This match up was similar to last year’s against the Blue Raiders, thankfully, both games ending with a VCU win. Senior JeQuan Lewis led all rams in scoring with 20 points on the night and redshirt Freshman Samir Doughty was right behind with 14. MTSU is especially good at forcing the other team to turn it over but VCU held their ground and only turned the ball over 5 times, giving the Blue Raiders only 6 points from turnovers. On the other hand, MTSU turned the ball over 12 times, allowing the Rams to capitalize with 14 points off turnovers. VCU may have won on the scoreboard but they certainly lost the rebounding match up tonight. VCU grabbed just 28 rebounds to MTSU’s 39. The win moves VCU to 8-3 on the season and will host Louisiana-Monroe on Thursday, December 22nd at 7pm.